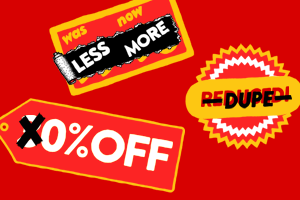 British supermarkets manipulate and exaggerate discounts in order to con shoppers into believing they are making savings that do not exist, says Consumers’ Association charity Which?, which is using its legal powers to take issue with the Competition and Markets Authority (CMA), a UK government department responsible for strengthening business competition and preventing and reducing anti-competitive activities. Approximately 40% of groceries in the UK are currently sold on promotion. In 2013, British consumers spent £115 billion on groceries and toiletries. They could collectively be losing out to the tune of hundreds of millions of pounds annually, even if only a tiny percentage of offers are misleading. Multi-buys: prices are increased when going on multi-buy so that the savings are less than claimed. Products are more expensive when they are included in the multi-buy. Asda, for example, raised the price of a Chicago Town Four Cheese Pizza Two-Pack to £2 from £1.50 as it went onto multi-buy at two for £3. It returned to £1.50 as the ‘offer’ ended (2014). Larger pack better value: the individual item price of the bigger pack can actually be more expensive. Tesco, for example, sold four tins of Green Giant Original Sweetcorn for £2 (from £2.44). However, six tins at £3.56 were proportionally more expensive. This was despite the fact that the large pack had a ‘special value’ claim (2014). Seasonal offer: where the dearer price was only applicable out of season. Researchers found that a Nestle Kit Kat Chunky Collection Giant Egg was advertised at £7.49 for only 10 days in January at Ocado. However, it then sold on offer at £5 for 51 days (2015). While repeatedly raising the issue of misleading and unfair pricing tactics in the grocery retail sector, little has changed, “So we’re using our legal powers to act on your behalf, submitting a ‘super-complaint’ to the CMA,” says Which?.